Dr. Michael Siegel was an attorney in Munich, Germany. 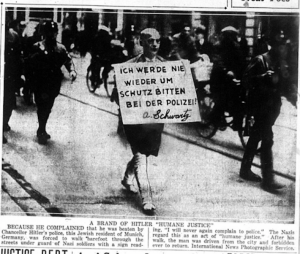 On March 10, 1933, he reported to Police Headquarters in Munich to file a complaint against the unwarranted and unauthorized arrest of his client, Mr. Uhlfelder, the owner of a prominent Munich department store. 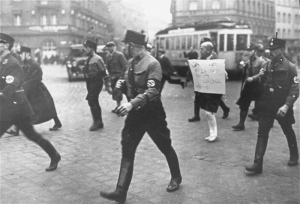 Upon his arrival at the police station, Dr. Siegel was directed to a room, where he was confronted by Nazi storm troopers (SA), many of whom had been deputized as auxiliary policemen in February 1933. They beat up Dr. Siegel, knocking out some of his teeth, perforating one of his ear drums, and cutting the legs of his pants. The SA then hung a board around Dr. Siegel’s neck and paraded him barefoot through the streets of Munich. When they reached the train station, the Nazi storm troopers threatened to kill him, but finally Dr. Siegel jumped into a taxi and sped home to safety. Dr. Siegel continued to live in Munich until 1940, at which point he fled Nazi persecution by immigrating via the trans-Siberian railroad from Berlin, Germany across the Soviet Union and by ship to Japan and then across the Pacific to Peru. Dr. Siegel died in Lima, Peru in 1979 at the age of 96. Soon after coming to power, Adolf Hitler and the Nazi-led German government enacted regulations and policies to exert controls over the German press. The Propaganda Ministry, through its Reich Press Chamber, assumed control over the Reich Association of the German Press, the guild which regulated entry into the profession. The Propaganda Ministry aimed further to control the content of news and editorial pages through directives distributed daily to regional or local papers. Detailed guidelines stated what stories could or could not be reported and how to report the news. Journalists or editors who failed to follow these instructions could be fired or, if believed to be acting with intent to harm Germany, sent to a concentration camp. The Nazis were also determined to prevent criticisms of their regime and reports of Nazi brutality from reaching the outside world. Foreign correspondents were closely monitored by German authorities and faced the continual threat of expulsion or even imprisonment and violence. 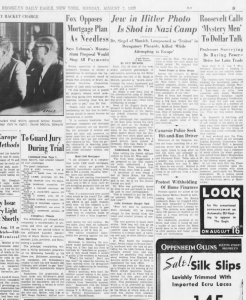 It was in this context, that the story of Dr. Michael Siegel’s abuse and humiliation found its way into the American press, where it became iconic of Nazi brutality. 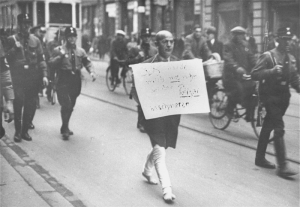 On March 10, 1933, a photographer named Heinrich Sanden took two photographs of Dr. Siegel as Nazi storm troopers marched him through Munich. Sanden promptly took his film to the Wissmann photographic company, where he and Wilhelm Wissmann developed the negatives. The Munich newspapers were not interested in reporting on the incident nor would they publish the images. However, Sanden approached a photographer for the American company, International News Reel. He was very interested, and Sanden mailed the negatives to him in Berlin. From there, prints of the photograph were reproduced in newspapers throughout the United States. 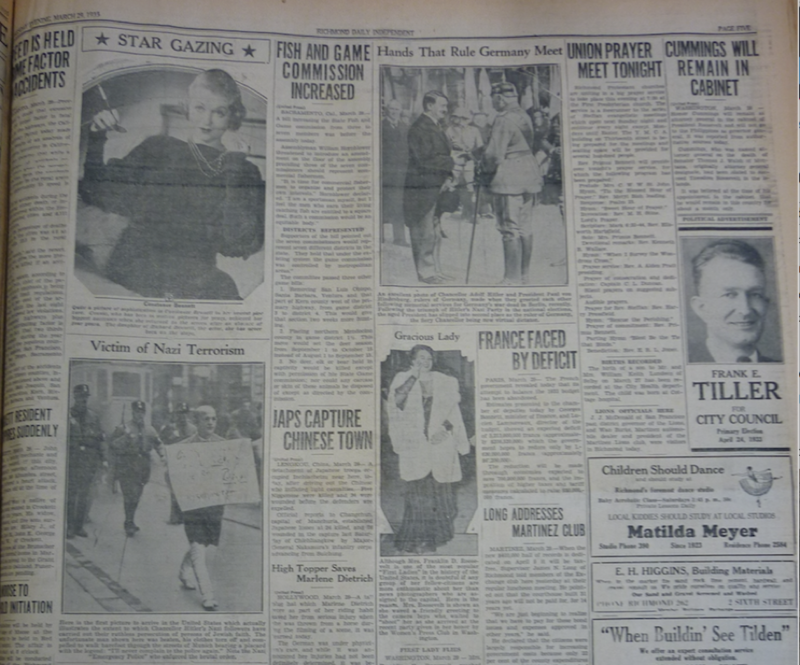 Several citizen historians have uploaded articles related to this story, allowing us to draw some conclusions about how US newspapers presented this event. 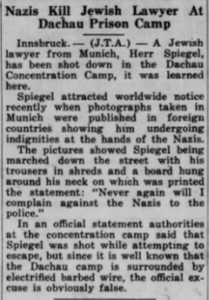 Generally, US newspapers reported certain elements of Dr. Siegel’s story correctly — he was beaten by “Hitler’s police”; his clothes were torn; and he was forced to walk barefoot through the streets of Munich. However, none reported that he was an attorney reporting on behalf of a client, and they got other details wrong, too — he was not driven from the city and forbidden to ever return. Unfortunately, the writing scrawled on the board around Dr. Siegel’s neck was not clearly legible in either of Sanden’s photographs. 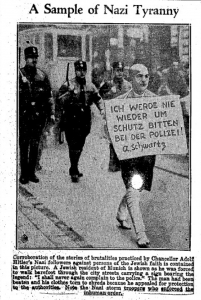 Based on the preponderance of available evidence, the board probably read, “I will never again complain to the police.” Perhaps because it was such a prominent feature in the images — and such an evocative symbol of Nazi cruelty — newspapers did their best to interpret the writing, and in many cases, they even “enhanced” (i.e., doctored) the photograph. “A Brand of Hitler ‘Humane Justice. '” Washington Times. 1933-03-23. Found by Lela T. in the DC Public Library. Detail image is from the same front-page story. One day later, the image appeared on the front page of the Henderson Daily Dispatch in Henderson, North Carolina. Here, the caption is almost identical; perhaps this reflects information that International News Reel provided with the photographs. 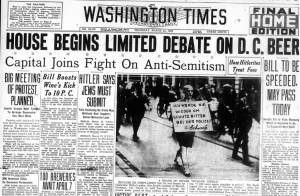 A noticeable difference, however, between the Henderson Daily Dispatch and the Washington Times, is that the Daily Dispatch appears not to have doctored the placard around Dr. Siegel’s neck. The text remains illegible. On the other hand, either this is a third photograph with a slightly different perspective, or the photograph has been cropped and “condensed.” Note how the three SA men are now bunched together closely behind Dr. Siegel. This same version appeared on page 5 in the Richmond Daily Independent (Richmond, CA) on March 29, 1933. 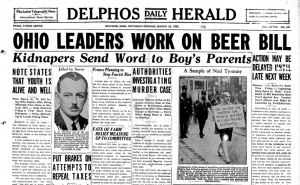 One day after the Henderson Daily Dispatch and four days before the Richmond Daily Independent, the Delphos Daily Herald in Delphos, OH also published the photograph on its front page. The caption is largely the same. However, the photo now appears to have combined the same cropped photo used by the Henderson Daily Dispatch with the same imagined sign text used by the Washington Times! “Herr Spiegel” or Dr. Siegel? 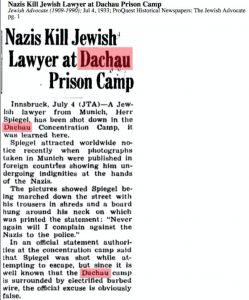 In early July, news leaked out of Europe that “Herr Spiegel” had been shot at the Dachau concentration camp. This news was sometimes reported as part of a larger story about a number of Jews, including Jewish lawyers, who had been killed at Dachau. “Herr Spiegel” was understood to be Dr. Siegel, the same man who had appeared in the infamous photographs a few months earlier. The following month, the Brooklyn Daily Eagle (New York, NY) reported on page 3 of its August 7, 1933 issue “Jew in Hitler Photo Is Shot in Nazi Camp.” This article identified the man as Dr. Siegel of Munich, and claimed that news of Dr. Siegel’s death had been reported to Rabbi Stephen Wise during a fact-finding mission in Paris. It is likely that the Jewish Telegraphic Agency picked up this story from Rabbi Wise, and from there it spread through the press. 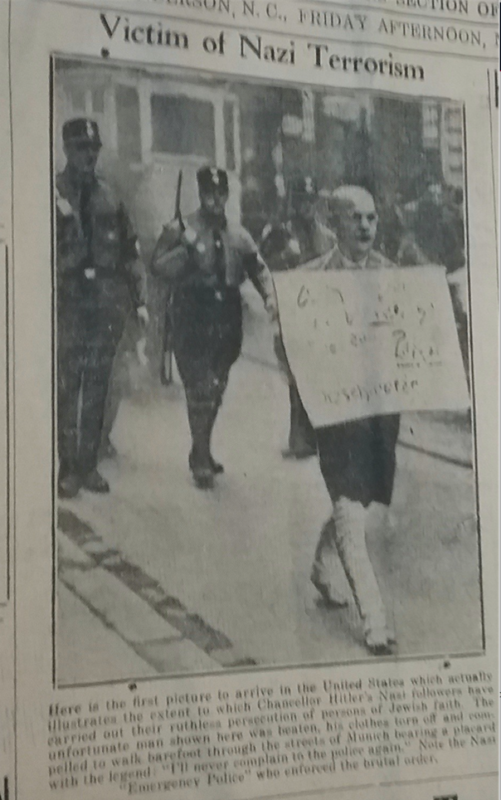 “Jew in Hitler Photo Is Shot in Nazi Camp.” Brooklyn Daily Eagle. 1933-08-07. Found by Bernard G. via the Brooklyn Public Library. 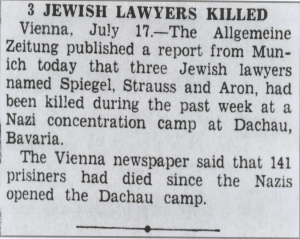 It is unclear whether a man named Spiegel was actually among those killed at Dachau; though it is known that Dr. Siegel was not among the dead. As for Mr. Uhlfelder, whose arrest originally catalyzed the events of this story, he was released but was re-arrested and sent back to Dachau during Kristallnacht. Similarly to Dr. Siegel, Uhlfelder and his family later secured visas for India, to which they fled and where they survived the Holocaust.